It is time to once again highlight one of the many animals that call Ohio home. 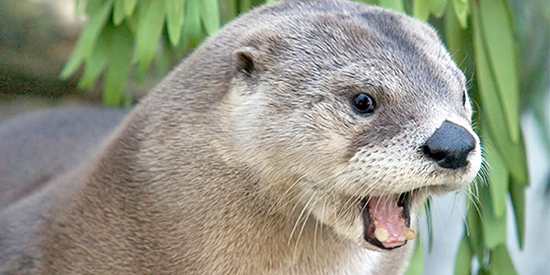 For this week’s animal, we will go to the water as we feature the river otter. Where does it live? What does it eat? What does it look like? Read on to find out the answers to these questions and more about the river otter and its history. Traditionally, the river otter has been found around North America with the exception of the cold Arctic regions and the desert Southwest. They once were found throughout Ohio but became nonexistent in the state by the turn of the 20th century. According to the Ohio Department of Natural Resources (ODNR), the Division of Wildlife began an effort in 1986 where they intended to bring back the river otter to Ohio by bringing them up from Arkansas and Louisiana. Today, the river otter can be seen in about two-thirds of the state with eastern Ohio seeing a higher population. It is no secret that the river otter is a species that is well adjusted to a life in the water no matter the season. The fur of this animal grows to be thick, which helps provide them with a source of insulation as they are swimming in colder waters. Overall, they have a dark brown appearance with a light brown on the face and stomach. River otters have webbed feet that allow them to swim through the water with ease, which are assisted by a large, flat, muscular tail that provides speed for them and that can make up about half of a river otter’s weight, according to ODNR. On average, this species ranges in weight between 10-35 pounds and grow to a length of about three to four feet. According to the National Wildlife Federation (NWF), the river otter’s whiskers come in handy as they rely on the whisker’s sensitive nature to find and locate their prey in murky water or in darkness. The NWF writes that the river otter can make a home in a variety of water-based habitats such as ponds, lakes, rivers, marshes and estuaries, given that there is plenty of food to be found. Their home consists of a den located in water with hidden underwater entrances similar to that of the beaver. ODNR writes that this animal is able to live in either a freshwater habitat or a saltwater habitat, but that they typically prefer the tributary of a large body of water that is free from pollution and relatively untouched by humans. Within these habitats, they will dine on items such as crayfish, snakes, frogs, fish, and the occasional waterfowl. NWF states that the river otter has a high metabolism, presenting the need to have frequent meals. Some of the river otter’s predators include animals such as bobcats, alligators, or coyotes. ODNR notes the river otter exhibits either a nocturnal behavior, meaning they are active during the nighttime hours, or a crepuscular behavior in which they will be active either a dawn or dusk. They enjoy a family oriented lifestyle, often being spotted in large family units. River otters will begin their breeding season early in the spring with otter “pups” born blind and without teeth. According to ODNR, they will experience rapid growth, gaining the ability to survive on their own by the age of six months, yet the family will remain together for another one to two months or even as long as just prior to a new litter being born. The typical size of a river otter litter ranges between one to three pups, which can live up to about nine years in the wild. Now that you know a little more about the river otter, have you spotted one near you? The river otter is just another of the many species that can be found through Ohio. Stay tuned to further additions to our Ohio Wildlife Species where who knows what amazing animal may be feature next! Is there a particular species you want to know more about? Let us know and we can make it part of the series.